Q: When is Grand Canyon National Park open? Grand Canyon National Park's South Rim is open 24 hours a day, 365 days a year. Please refer to the Grand Canyon National Park's website for current operating hours and seasons. 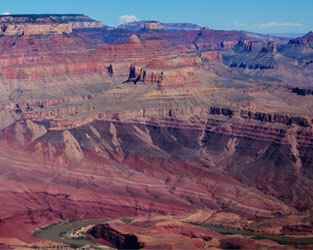 Q: What is the National Park Service (NPS) entrance fee at the Grand Canyon? Please refer to the Grand Canyon National Park's website for entrance fees and recreational pass information. Q: What's there to do in Grand Canyon National Park? 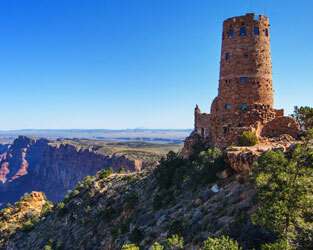 Please refer to the Grand Canyon National Park's website for South Rim and Desert View activities and adventures. Q: Which travel route do you recommend if traveling from Las Vegas or Phoenix? The South Rim allows you several options. Common driving routes are from Williams, AZ (via State Route 64 from Interstate 40) or Flagstaff (via US Highway 180). View detailed driving information from the National Park Service. Q: How far in advance should overnight accommodations be reserved? Reservations can be made up to 13 months in advance. If visiting in our high volume season (May through October) we recommend making reservations 1 year in advance. Q: Where is the Skywalk? The Skywalk is located on the Hualapai Indian Reservation on the West Rim of the Grand Canyon, about 120 miles from Las Vegas and 250 miles (5 hour drive) from the South Rim. Q: What will the weather be like in _____? There is no way to tell for certain what the weather will be like at any particular time of year, but you can visit our Weather page for seasonal average temperatures and current conditions. Q: Is there anywhere close by where we can buy groceries? 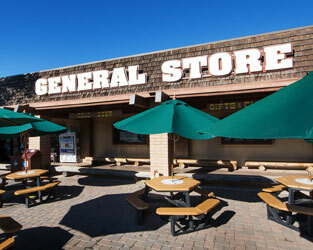 Yes, there is the General Store at Market Plaza that is just a short walk from Yavapai Lodge®. It includes a grocery store, retail shop, and deli. There is also a General Store located in Tusayan, a small town located about 6 miles outside the south entrance of the park. Q: Do we need to bring a flashlight for night time? The Grand Canyon gets very dark at night, and it is recommended that you bring a flashlight if you intend on being out after sunset. Q: I hear you cannot buy bottled water in the park. What are the options? Yes, this is true. The National Park does not allow bottled water less than a gallon size to be sold inside the park. This is to discourage plastic waste and reduce our carbon footprints. A great alternative would be to purchase a refillable water bottle that can be filled up for free at water stations inside the General Store. Yes, we have WiFi. However, due to our remote location, the WiFi has limited bandwidth and is not ideal for downloading, streaming, Skype, etc. The WiFi is available at the Yavapai Lodge main building, and the Deli located in the Canyon Village Marketplace. WiFi is NOT available in Yavapai Lodge guestrooms. Q: Are there open positions or career opportunities at Grand Canyon? Yes, please visit our Jobs page for seasonal jobs, or our Corporate website for careers. Q: Are there hairdryers in the rooms? Yes, all rooms at Yavapai Lodge have hairdryers. Q: Are there refrigerators in the rooms? Yes, mini-refrigerators are in each room. Q: Do the rooms have air conditioning? Rooms in Yavapai East all contain air conditioners. Rooms in Yavapai West do not, but they do have a ceiling fan. Q: Do you have non-smoking rooms? Yes, all of our Lodges have non-smoking accommodations. Q: When is check in? The registration desk at Yavapai Lodge is staffed 24 hours a day, 7 days a week. Check in time is 3:00 p.m. and check out is 11:00 a.m.
Q: Are dogs allowed at Yavapai Lodge? Yes. 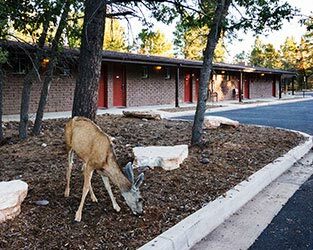 Yavapai Lodge is the only pet-friendly hotel in Grand Canyon, with a number of rooms available for guests traveling with their dog or dogs (up to 2 per room). A number of pet-friendly rooms are available in Yavapai West, and there is an additional $25 pet fee per day. We offer a Pets in the Park Package which includes: loaner kennel, waste bags located in receptacles outside of building 9, loaner food/water dishes, and treat in the room. The package will also include the pet fee. Guests MUST book a pet-friendly room when booking to accommodate pets. View a copy of our Pet Policy. Yes, WiFi is available at the Yavapai Lodge main building (WiFi is not available in Yavapai Lodge guestrooms). HOWEVER, due to our remote location, the WiFi has limited bandwidth and is not ideal for downloading, streaming, Skype, etc. Q: Do your RV sites have hookups? If you have a guaranteed reservation, a notice will be posted on the welcome building door with your last name, reservation number, and the site number you are assigned to. If you do NOT have a reservation, there will be a sign posted at the welcome building with available sites listed (if any). Q: Where are the nearest shower facilities? There are coin operated showers down the road at Camper Services (at the entrance to Mather Campground). It's a half-mile walk, or you can drive your car. Q: Where is the nearest laundromat? There is a coin operated laundromat down the road at Camper Services (at the entrance to Mather Campground). It's a half-mile walk, or you can drive your car. Q: Is there WiFi at Trailer Village? No, there is not. However, there is free limited WiFi available down the road at the Canyon Village General Store and Deli (a half-mile away), as well as the Yavapai Lodge lobby. Q: Where I can I exchange my empty propane tank(s)? Empty propane tanks can be exchanged at Canyon Village Market. Q: Are we allowed to bring our pets? Yes you can, but they must be on a leash when outside. Q: Is there any public transportation available so I can leave my RV in the site? Yes, there are free shuttle buses that stop every 15 minutes at Trailer Village. Q: Is there cable TV at Trailer Village? DirecTV services are available for paved RV sites only on the back of the electric box. Q: How far is Trailer Village from the rim? Trailer Village is approximately 1 mile from the South Rim. Q: What is the historic Watchtower and what does it overlook? The Desert View Watchtower® was built in 1932, and opened to the public in 1933. It was designed by Mary Jane Elizabeth Colter, whose vision was to have the highest view point with a 180-degree lookout into the canyon. From the overlook, one can see the Colorado River, Tanner Rapids, the Little Colorado Gorge, Painted Desert and the North Rim. The Tower has 85 stairs and 4 levels, with about 20 stairs on each level. The design is based on ancient Native pueblos and ruins. Q: Where is Desert View? Desert View is located 23 miles east of the South Rim (roughly a 35 minute drive). Q: What can visitors buy at the Trading Post? The Trading Post is at least 70% Made in America and at least 60% Native American Products. It covers the 4 Corners area of Natives with Hopi, Navajo, Zuni, Jemez, Acoma, and Santa Clara. Q: What food can I buy at Desert View? The Trading Post Deli provides healthier choices all made to order, such as deli sandwiches, pizza, soup, hot dogs, chili dogs and ice cream. There is also a Grab 'n Go section for those who are on a time limit, filled with sandwiches, yogurt, fruit cups, hummus, desserts and juices. Q: What can I buy at the General Store? The General Store has a variety of dry food items, which works well for those camping at Desert View. There is ice, firewood, wine, beer (no liquor), milk, eggs, and hot dogs. There is no produce and no meat other than sandwich meat at Desert View General Store. The Store also has a variety of souvenirs including T-shirts, hats, magnets, postcards, DVDs, a youth section with plush items, games and apparel, a stamp machine, ATM and sundries. Q: Is Desert View open year-round? Yes, the hours vary from season to season. There is a Chevron service station (the only one in the park), which also has seasonal hours, but visitors can pay at the pumps with a credit card year-round. Q: Are there hiking trails at Desert View? There are no hiking trails at Desert View. The closest hiking trail is at Lipan Point, which is 3 miles west of Desert View. Tanner Trail goes to the river and is very strenuous, even for the experienced hiker..
Q: What if I want to camp at Desert View? 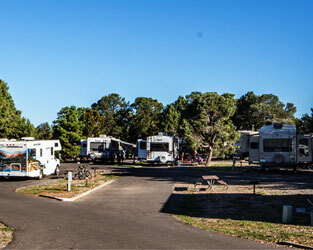 The Desert View campground is run by the National Park Service. It has 50 camp sites, which are full from opening day (mid-May) until closing (mid-October). There are no reservations, so it is first-come-first-served. It is an automated payment system of $12.00 per night.